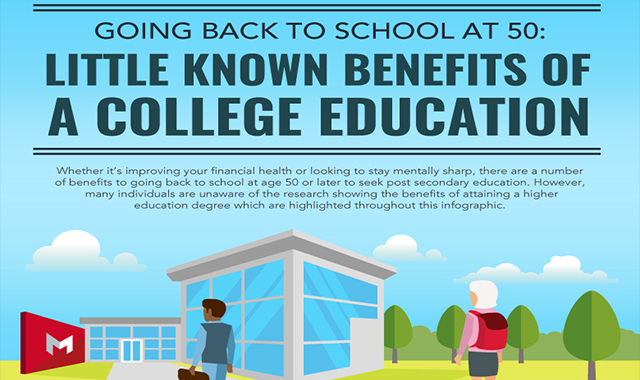 Going Back to School at 50: Little Known Benefits of a College Education #infographic ~ Visualistan '+g+"
Whether it’s improving your financial health or looking to stay mentally sharp, there are several benefits to going back to school at age 50 or later to see post-secondary education. However, many individuals are unaware of the research indicating the benefits of attaining a higher education degree.Several studies indicate that college degree holders not only tend to live longer, but they’re also able to share additional benefits of higher education with their families and those closest to them. According to a study published in Health Affairs, the life expectancy for men with a bachelor’s degree was 12.9 years higher than those with less education. For women, the life expectancy for bachelor’s degree holders was 10.4 years higher than those without a degree.